Lake Wicwas Nature Journal: August 26, 2012 - Osprey! A quintessential New Hampshire summer weekend: warm, sunny, calm and humid, but not oppressive. 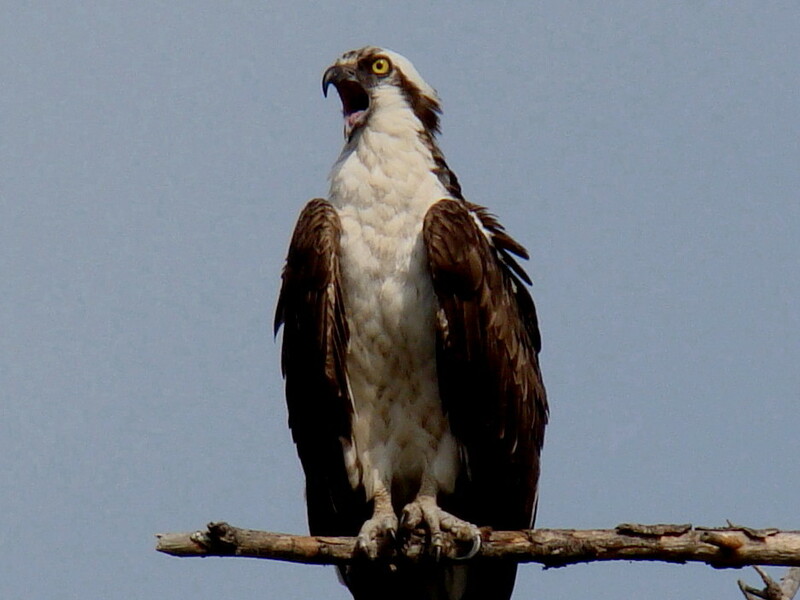 So it was no surprise when we heard the crash of an osprey into a placid Lake Wicwas in the late afternoon. 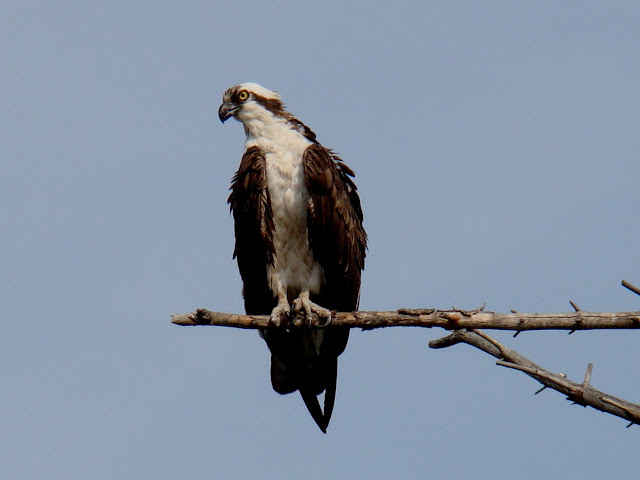 We had been watching hundreds of fingerling fish rising quietly at the surface for quite some time, and evidently, the fish-hawk was doing the same. It certainly is a startling sound - an osprey crashing into the lake - and it gets one's attention quickly enough that it is easy enough to find it flying up out of the water after its dive. The next day was a repeat of the perfect weather, so we went out on the kayaks to see if it was still in the neighborhood. It didn't take long to get the answer. Just few minutes down the cove we heard an osprey calling out. 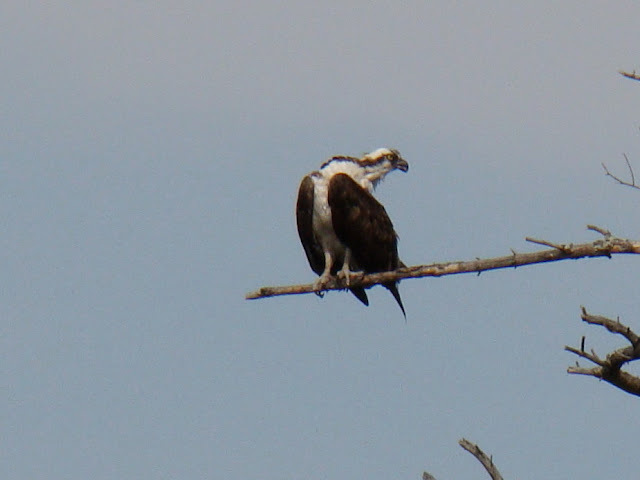 In fact we heard two of them calling to each other, one on each side of the cove, and saw one of them sitting in their favorite position - a branch about 30 feet high overhanging the lake. It soon circled out over the lake and assumed a new perch on a dead tree right at the point of an island. 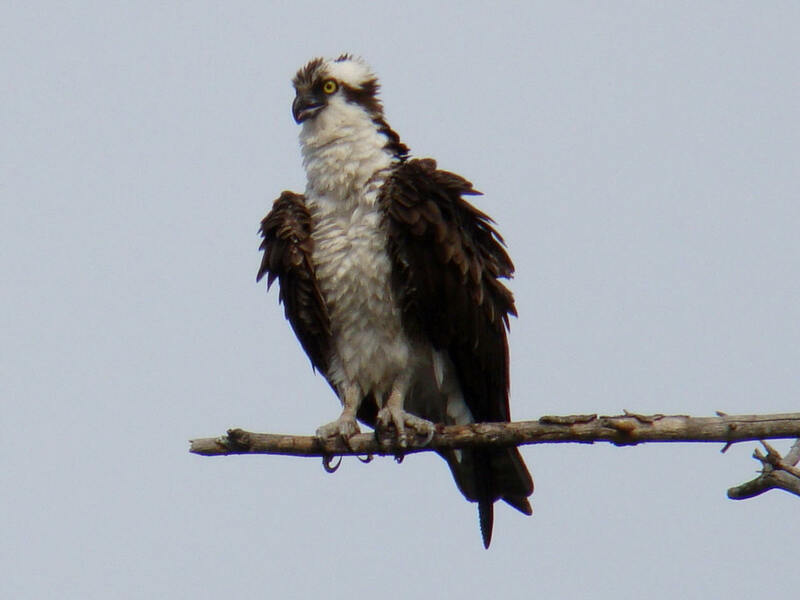 We heard it calling to the other osprey on the opposite side of the cove. But we couldn't locate the second. I have no idea if they are a mating pair; I have not seen nor heard of an osprey nest in the area, but they will fish up to twelve miles away from their nest. 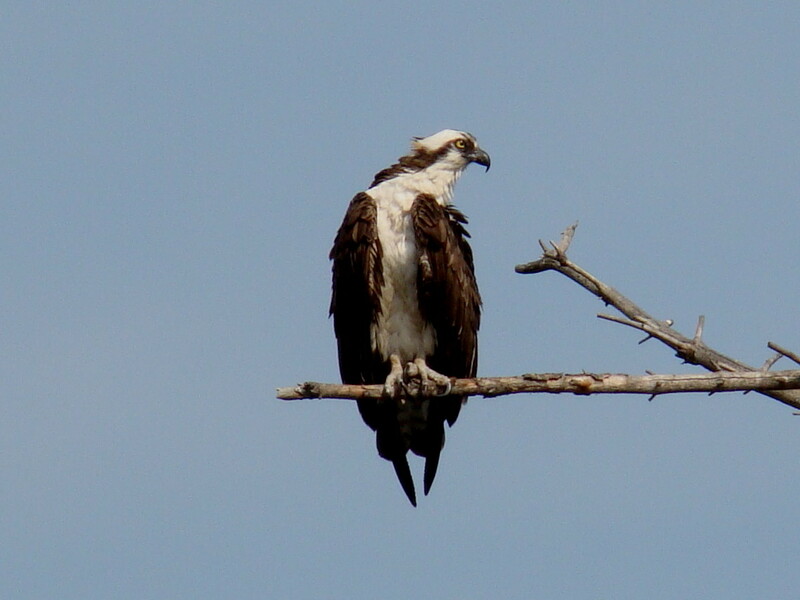 The bird seemed unconcerned with us down on the lake in kayaks, and we spend a long time watching it - and vice versa. 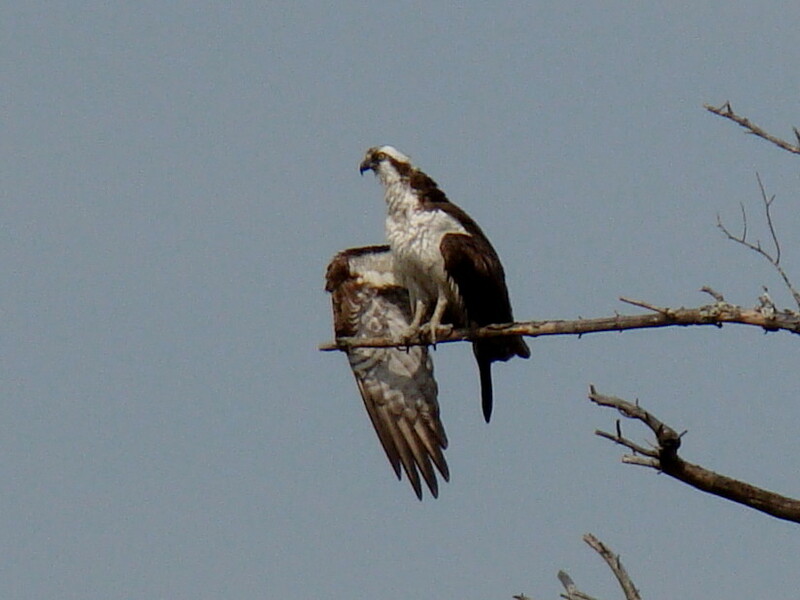 When it first landed it was hanging its wings down, like the cormorants do - perhaps drying its feathers? It spend a long time preening itself, working deep in its feathers. 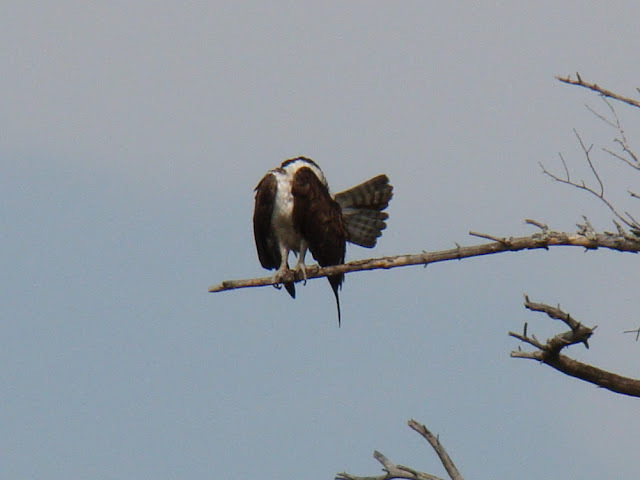 It seemed to be able to turn its head around completely backwards, just like and owl. 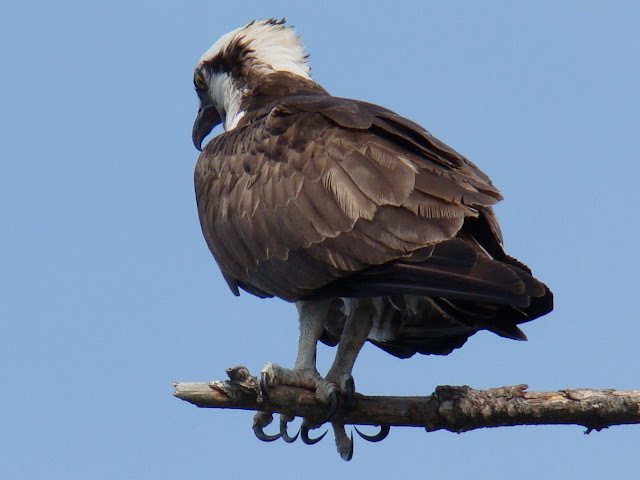 Also like an owl, an osprey can turn two of its talons around backwards, which is helpful in grasping fish and carrying them away. 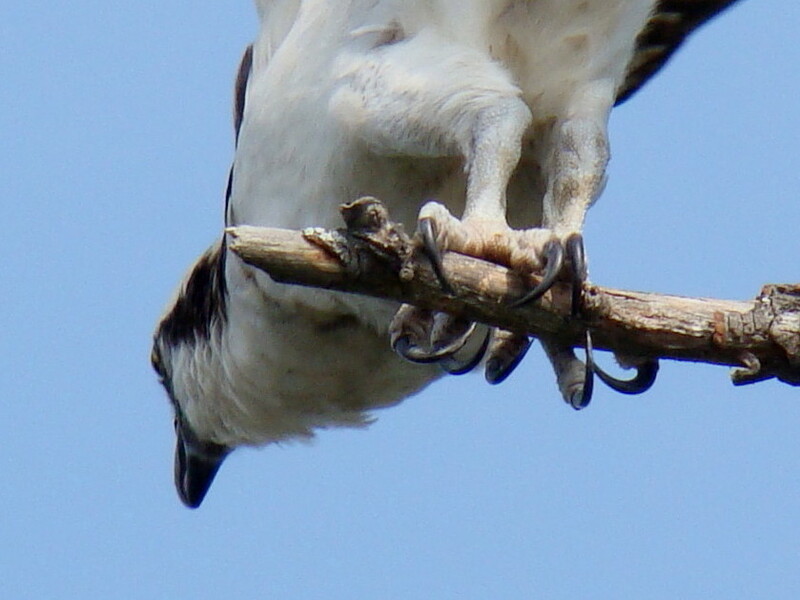 Here, its left foot has two talons back, while the right foot has one rear facing. Here's a view from the front, when it had reversed its grasp. 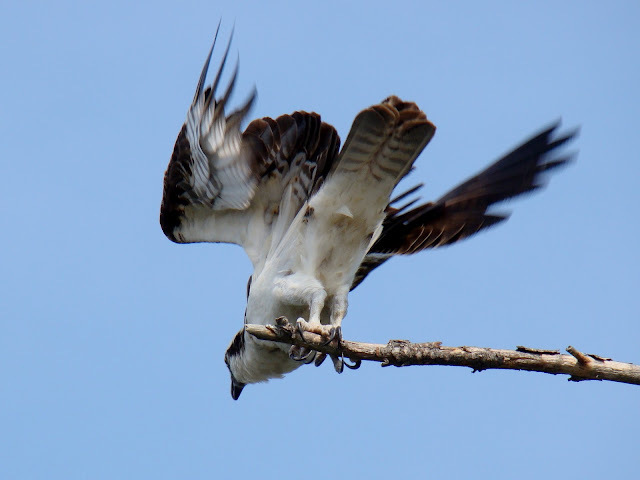 Ospreys and Owls are the only raptors that can do this. How'd you like to have these weapons piercing into you? You can see why they rarely drop their lunch. 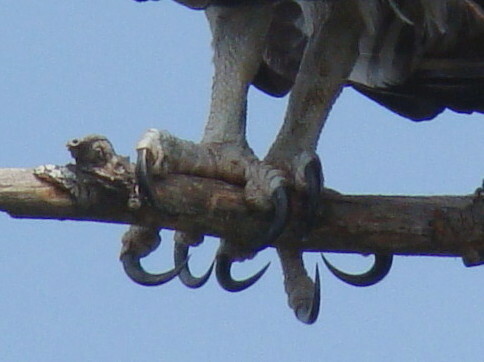 Their feet even have barbs on them to help hold their prey; they are pretty well adapted to their situation. 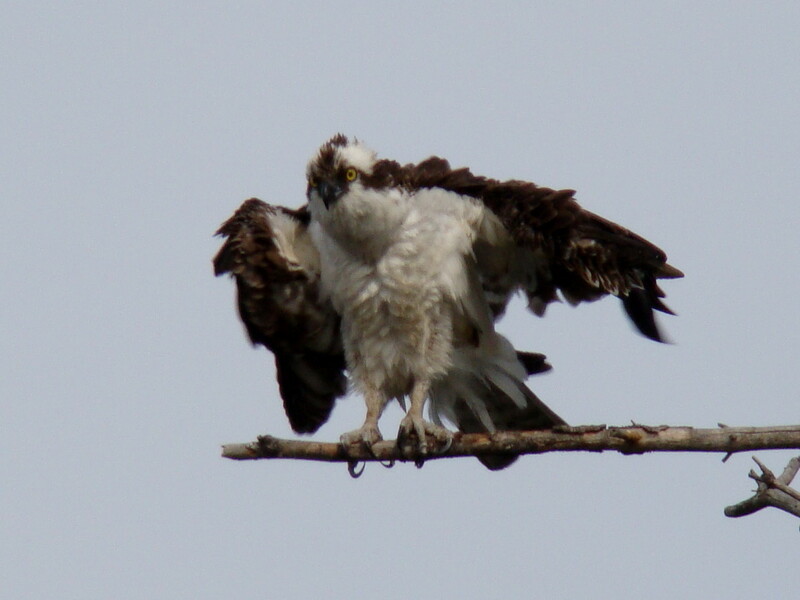 At one point after its preening, it fluffed up its feathers, looking like something from a Disney cartoon. I don't know the purpose of this, and didn't find anything about this behavior in my research. 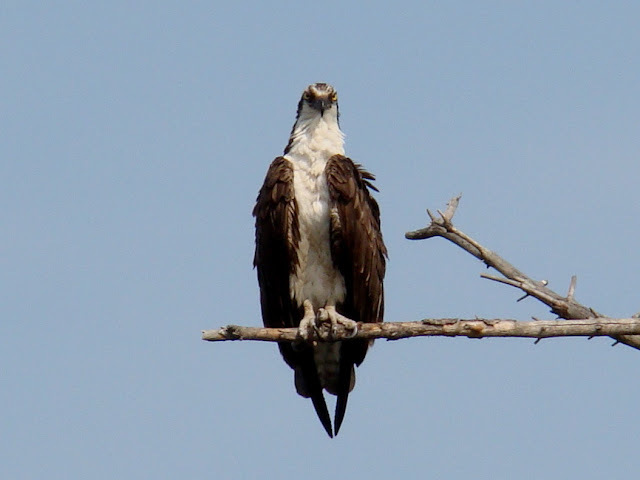 It's possible it decided it didn't like us watching, and was trying to look bigger to scare us off, but there was no other behavior that indicated this. Eventually it prepared for take-off, and flew down the lake a bit for better a fishing site - or one not shared by humans. We let it alone. From my observations, osprey perch on a lee shore where the flat water gives them optimum conditions for seeing fish below the surface. 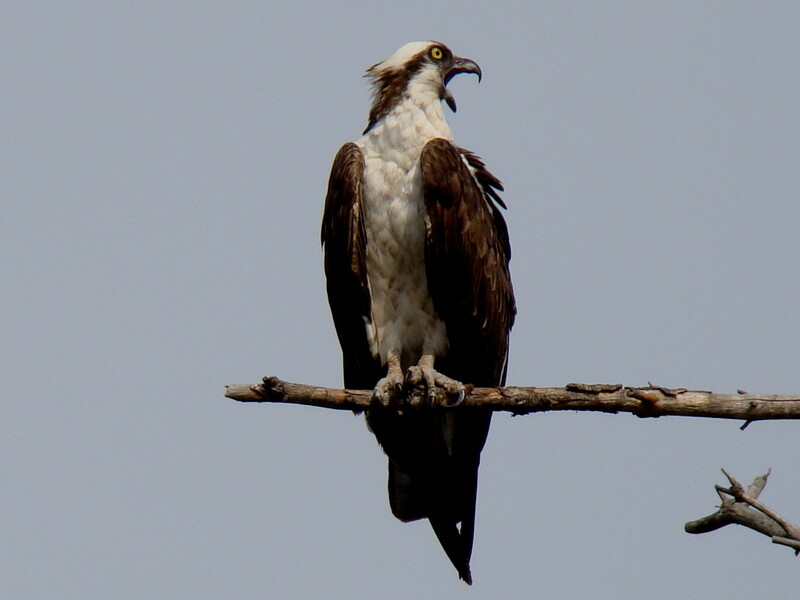 They can dive into the water as much as three feet, but not much more, so they only hunt in deeper water when fish are schooling on the surface - such as this time of year in Lake Wicwas. 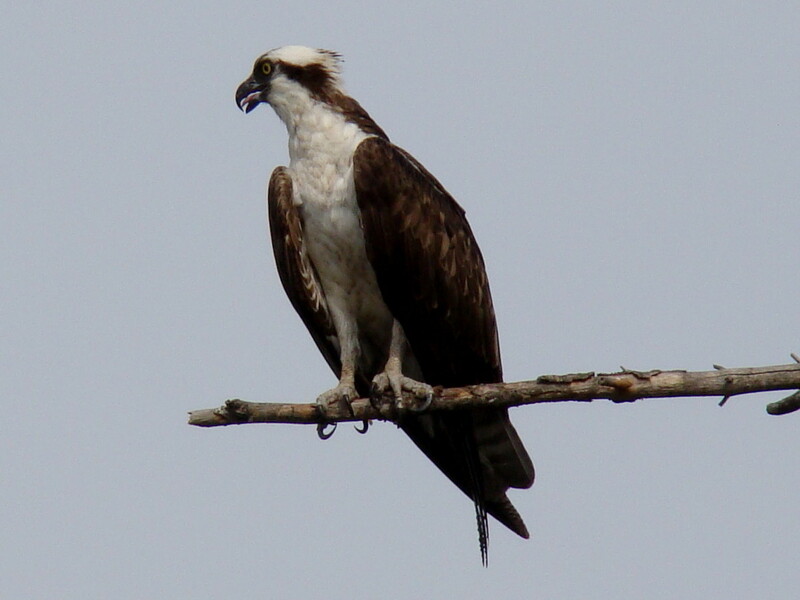 The Cornell Lab of Ornithology is a good source of information on birds, and provided much of this information; their web page on osprey is http://www.allaboutbirds.org/guide/osprey/lifehistory. They are a pretty imrpressive creature.